One element of authentic Montessori schools that often surprises parents new to the philosophy is the schools’ use of mixed age groups. Instead of placing students in classes with peers of their own approximate age (e.g., all 5-year-olds), Montessori students work together in classrooms comprised of ages 18 months–3 years, 3–6 years, 6–9 years, and 9–12 years (and after). So what are the benefits to this unorthodox class structure? Dr. Maria Montessori divided children into these age groups based on studies that showed distinct, three-year periods of cognitive development (also known as “planes of development”), starting with infants’ incredible abilities to absorb new information and continuing to where older children begin to formulate individual and group ethics. When in groups comprised of students in the beginning, middle, and end of each plane, children naturally teach and are taught by their peers, in addition to the instruction provided by teachers specializing in their developmental stage. Because students on the older end of each developmental plane will generally be more advanced in their abilities than their younger peers, older students are encouraged to teach what they know to younger students, who can both learn from and look up to their “elders”. Leadership encourages responsibility as well as creativity and interpersonal skills, and helps students to better understand their own mental processes. 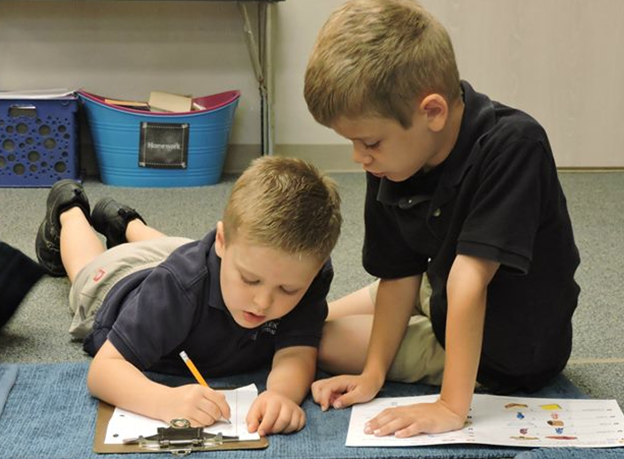 In our Montessori school in Frisco, TX, students are not only with the same peers for each three-year cycle; teachers also remain with their groups for the entire length of the developmental plane, allowing for each educator to better observe the individual needs of students and to more clearly understand and encourage the development of their unique learning style. Teachers’ careful attention to each child’s needs is a hallmark of the Montessori Method. It is rare for children to interact strictly with individuals of their exact age group outside of the classroom, so why cultivate this unnatural environment at daycare or school? While physical ability and experience are usually linked to age, intelligence is not – thus, placing students where they can interact with a range of ages, experiences, and abilities provides a far more realistic representation of the world outside classroom walls, better preparing children for their teens and adulthood. To learn more about the benefits of mixed age groups, call our private school in Frisco, TX at (972) 712-8080 to speak to a member of our team.